It’s a strange picture, torn at one corner, stained, damaged by time. I have been looking at it for decades. There are two figures—a toddler, dressed in an Asturian costume, holding a doll in an identical dress, and a slender young woman, who holds her tightly by the hand. They stand on a median in Havana, next to the Malecón. I can’t place exactly where. The breeze blows from the water. It blows the young woman’s dark hair back. She looks toward the road or the sea wall, watching and interested, perhaps smiling a little, it’s hard to tell. Something has caught her eye. She seems at ease, graceful. The toddler beside her is planted sturdily at the center of the picture. Her small figure is transected by the pole of a streetlight that divides the composition. The child does not look toward the sea. She does not smile but seems to scowl at the camera. Perhaps she does not want to be in a picture, perhaps she is struggling to hold the doll, perhaps it is windy or loud. Directly above the child is a sign decorated with reveler’s masks, marking the days or the season of carnival. In those Asturian costumes, the toddler and her doll are signs too, small residues of pageantry. Perhaps at night, at another time, the place was crowded with revelers. Perhaps the carnival is over. In the photograph, the carnival sign, like the child, seems out of context in the empty streetscape. In the faded sepia, the daylit scene is somehow desolate. The figures seem exposed and vulnerable, part of some precarious balance. Behind the figures, a building’s windows seem either open or broken. Cars pass on the left. If we gaze closely, we see figures gather round a car on the right. The fading black and white photograph robs us of the essential palette and light of Havana—the blue, the golden light, the saturated textures and tawny skin. In black and white, and without signs of nostalgia or markers of wealth or sensuality, pictures of Havana become a challenge. They become exercises in documentary memory and demand a reckoning with the facts of politics, history, and loss. This photo was perhaps part of an album, tucked into photo corners. Or perhaps it was left loose between the pages of a book. Perhaps it was sent in a letter. Whatever archive it belonged to was an archive dispersed. The photo ended up a fragment long ago, and it has lived in books and envelopes for decades, free of a frame. There are pen marks on one side, the print is worn and apt to curl, the edges are breaking. Reading the picture carefully, one finds a trace of public memory. The carnival masks, at the distant center of the photograph, mark a rupture, and not only in the composition of the photograph. They seem to be signs from Havana’s carnaval of 1966, part of a long tradition of carnival in the city dating back to the 16th century. The Revolution had begun to transform the carnival with socialist themes in 1962. But carnaval was cancelled in 1967. That year, and for two years afterward, festivities were suspended as the state directed the population’s discipline toward harvesting ten million tons of sugar, the zafra de los diez millones, that became a national goal for 1970. The heroic effort fell short and the harvest came in at just over 8 million tons, but the carnival returned to Havana in 1970. From then on, it was no longer held during Lent, but moved to high summer, near the anniversary of the Revolution on July 26th. For me, the masks hover like an uncanny emblem above the figures on the median—the woman and child gazing in different directions in a divided landscape. The political landscape was also growing more divided. The late sixties mark a second wave of Cubans leaving the island: professionals, middle-class, and working class, of many races and social statuses. Although they were deliberately labeled white professionals on arrival in Miami, triangulated by the confrontation of Cold War and civil rights, those tens of thousands of Cubans leaving their country carried a complicated politics. With one allowable suitcase per person, one toy per child, they carried slender archives and heavy legacies of choice into exile. The dispersed gazes in the photograph echo the divided trajectories that separated many Cuban families. The photographer, my great-uncle José Luis, left for Miami, and then went to San Juan, Puerto Rico. I am the child in the homemade costume, holding my cousin’s hand under the masks on the Malecón. By 1970, when the carnival returned to Havana, half of my family had left Cuba, taking me with them. Intending to settle in the Northeast, my parents flew to Miami and never left. The young woman stayed and lives in Havana still, a veteran of the Revolution and all that came after. The young woman in the picture is Lucila Jiménez Castro. She is my beloved second cousin, the daughter of my grandmother’s sister, and her namesake. My parents have no siblings, so Lucilita was both glamorous young aunt and cousin to me. Slender, intelligent, and musical, funny, quicksilver, and gentle, she is a tender and solid person, a loving purchase for my early Cuban memories. She shaped, in direct and indirect ways, everything I understand about Cuba. A woman of conscience true to her left-leaning family, Lucilita fell in love with a tall, thin, gentle revolucionario, a young becado scholarship boy, sent from the countryside to study in Havana. His name was Albio Castro and Lucilita married him in the early years of the Revolution, before I was born. I imagine that I remember Albio’s tall build, his kindness and his olive drab. Albio and Lucilita, their romance, and their political choices, made the Revolution an intimate story, not merely a historical event. Like the rest of my mother’s family, who chose to stay and believed in its promise, Lucilita made it impossible ever to have contempt for the Revolution, or to dismiss and demonize its followers, to deride political love. 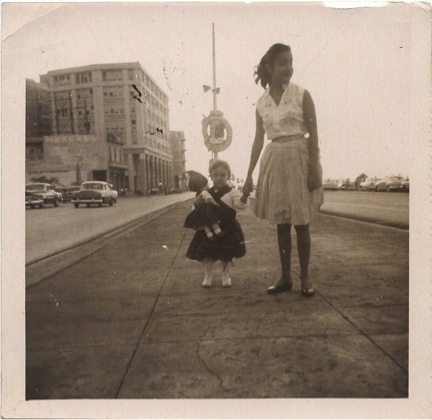 With my family split between Havana, Puerto Rico, and Miami, my grandmother in Miami and her sister in Havana created decades of correspondence, urgent epistolary intimacy to bridge the gap. As my parents worked feverishly to keep us afloat, under my grandmother’s tutelage my younger sister and I wrote our first letters in life to her sister, to our great-grandmother Mamita, to Lucilita and Albio, to the beloved Nena Jiménez, another matriarch of the Havana household. It seemed sometimes as though we were learning to read and write to compose those letters to Havana. Every accent and word of Spanish had to be right, proof that we had not lost our language. For young girls, it was an early lesson in the responsibility of words, the right words, and a lesson in the work of correspondence. My grandmother urged us to write better, write more often. Every letter was a test of accents, ortografía. As I got older, I delayed, put off the weighty task. When Mamita died in Havana, I felt a terror that she had died because I had not written to her enough. I was nine or ten. After that, it became harder to write to Cuba. Even when we did not write the letters, my sister and I would address the envelopes: Marianao 14, Número 6203, Esquina 62, altos. It is indelibly etched in my memory, like Lucila’s phone number, memorized through repetitions to English speaking operators my grandmother could not understand. The letters achieved what those emotional phone calls never could. They established a sustained and lovingly coded dialogue. Through their correspondence, we followed, across thirty years and more, my great-aunt Lucila’s struggles, my uncle Braulio’s opaque life and death, but above all Lucilita and Albio’s life. Through them we knew life in Havana as it went on without us: the zafra (sugar cane harvest), jobs, the libreta (ration book), the trabajo voluntario (volunteer work), the birth of children, the school trips, the family vacations to the provinces or socialist holiday parks. We heard about my cousins and their gift for science, about Albio’s deployment to Angola and his return, the illnesses and deaths. They sent pictures of my great-grandmother, pictures of my cousins and their changing boyish faces, the children of my generation whom I barely knew. They also sent beguiling postcards of Cuba with their letters—dozens of blank postcards showing girls doing laps in a giant high school swimming pool, dinosaurs at a vacation theme park, kites flying at the Parque Lenín. The postcards accumulated in a box in my grandmother’s closet. In return, we sent family photos of the women in their Easter dresses posing in front of the run-down but serviceable gold Pontiac, photos of my two younger brothers, photos of the carnival of Halloween, photos to prove we were getting ahead, that they didn’t have to worry. In the first years, in the first decade, our letters to Marianao were padded with leaf thin paper-soap, shaving razor blades, women’s stockings, necessities hard to come by amid Havana’s rationing. The paper-soap began to melt in your hand in the heat if you held it too long, qué desperdicio my grandmother would say. They struggled in Havana, we struggled in Miami. My grandmother, like her sister in Havana, saved every scrap of paper, grocery bags, aluminum foil. In those first years, they stood in line for eggs and milk in Havana. We went to the refugio for evaporated milk and bags of dry beans. My sister Gigi, three or four years old then, hid bags of beans under her bed so we would not run short. Never a whisper of politics: both my grandmother and her sister wrote around the censors. For a revolutionary family in Cuba, cartearse con el exterior, writing to exiles abroad, was no small thing. On each side, the sisters knew their words might be read by the state, understood unwritten rules and subtle protocols of telling. They also probably lied to one another, softening the struggles. Like millions of Cuban women, they negotiated the mined landscape of ideology and emotion across decades of separation. The years and their emotional segregations created in my family an ambivalence about political memory, a sense that it was important but dangerous, something perhaps not to be trusted. That is the legacy of a long Cold Civil War. Attending to this memory requires a perverse devotion and an immense labor: sifting through archives and material culture, mining familial, textual, and political genealogies. A difficult working through of remembering and misremembering is called for, demanding care and respect for the artifacts and traces of what is missing. In that process, we call up the bonds and losses of love structured by politics and political rupture, the memory and silent understanding not only of emotions but of deep commitments, love that is not merely individual, or familial, or even a national love. Remembering, I understand what it is that binds me to Lucilita, and to Cuba, after so many decades and so much distance. That bond is political love. Written into letters, threaded through conversations, visits, arguments, and even silences, there has been a dialogue about love beyond the private realm, forms of love expressed politically. In Cuba and its diaspora, the choices and secrets of political love shaped convictions about possibilities and resistance, educated us in sacrifice, solidarity, and loss. It translated to intimate practices and ways of knowing the world. Political love—for justice and freedom, for people and cities and national communities, for leaders and revolutionaries, for ideas and practices of common good, at home and in exile—this kind of national love shapes collective and individual character, and also our understanding of the distance between the nation and the state. Cuban writers, musicians, and artists have been invoking political love for two hundred years; philosophers and scholars have meditated on the nation and political love. But I am thinking beyond nationalist feeling and ideology of something more intimate, involving eros and caritas, desire and care. Political love is privately felt, but it helps us recognize what is common between us, remakes lo común. In a time when Cuba is being reimagined from the perspective of the United States as an object of desire and transaction, our Cuban collective memory might move to another negotiation: to think beyond nationalist nostalgia or dreams of development and take up the buried histories of political love. It is the legacy of women who wrote around censors, of families sending remittances, of dedicated revolutionaries or political prisoners who refused hatred or vengeance. These are Cubans who lived past the speculations of the present to lay hold of the past as something more than a fetish. Reckoning with political love transforms memory, challenges our myths. Cubans in Cuba and in its diaspora know intimately the secrets and cost of political love: the thing that bound and broke our families and shaped us as people. Too often, for Cubans, the story of political love ends in disillusionment, betrayal, rupture, a narrative of disenchantment that produces a profound paranoia. But looking at the picture of myself with Lucilita, and dwelling on its ephemeral moment, I imagine political love summoning care, respect, and repair. Political love calls us to tell a story again. Lucila Jiménez Castro is very ill in Havana. I am in New York, trying to get papers to see her again. I am studying her face in a photograph, reading the picture and its emblems again. In the retroaction of remembering, its posterioridad, something begins to change. In the distance between us or the telling together, the work of memory makes more lucid frayed genealogies and lost beginnings—all those scattered archives of political love.